There are those who pooh-pooh The House of Eliott. When you mention that you will be snuggling down for an entire weekend in a darkened room with Series Two on DVD and a box of chocs, they automatically remind you of the French and Saunders parody “The House of Idiot” – which featured, as I recall, Kathy Burke as a cockney seamstress with an outsized pain au raisin attached to each side of her head, like earmuffs. But The House of Eliott absorbs parody, and just grows bigger on it; of course it does. 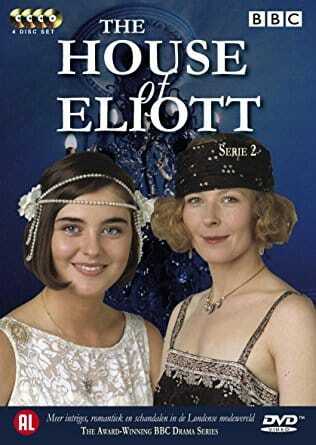 I am of the opinion that The House of Eliott has a claim to archetypal status, alongside Little Women or Rebecca. And people didn’t always scoff at it, you know. When it was first shown in the early 1990s, it was (dare one say it) the Doctor Who of its day – a proper family drama for a Saturday evening, on which BBC1 had lavished a relatively large production budget for costumes and locations. Every time an Eliott sister went to a party, she had to have a spectacular new beaded outfit with matching head-band (“The colour! The texture!”); every time a character stepped outside the building, there had to be that same old vintage taxi trundling past, making a parp-parp noise. And the effect was addictive. Between series of The House of Eliott, some of us actually didn’t know what to do with our weekends. We succumbed to lassitude and hopelessness. When The House of Eliott came back, we invited friends to watch it, so that we could all ignore the plot together and sigh, “Look at that coat! Look at that hat! That string of pearls is just so elegant!” It was a cunning aspect of The House of Eliott, incidentally, that neither sister ever said a word about how the other one was dressed. If The House of Eliott is now remembered mainly as a kind of joke, there are obvious reasons. First, for all the money spent on it, it looks cheap by modern standards, mainly because it was shot on video, which makes the picture quality both swimmy and flat. Second, it stuck rigidly to an old-fashioned girl’s-weekly kind of narrative of success and set-back, which was a bit frustrating for anyone wanting a bit more authenticity in the dialogue (“These designs just aren’t good designs, Evie. How can we compete with Maison Gilles if we don’t have better designs?”) And thirdly – well, sadly, the series clearly didn’t do much for the actors’ subsequent careers. What with all the terrible dialogue and everything, it was not a good showcase. I remember, in particular, that when The House of Eliott was first shown, some members of the audience were a bit shocked by Louise Lombard’s accent – but, oddly, time seems to have softened the offence of her Nineties demotic enunciation. Period drama has committed so many worse anachronisms in the intervening years (Becky Sharpe with a glottal stop, for heaven’s sake), that, by comparison, Louise Lombard’s Evie now sounds like Edith Sitwell. So, what happens in Series Two? Well, it’s 1924, and we begin with a trip to Paris! A chap called Gilles (with a Maison) invites the Eliott sisters to work with him in Paris, and they wear fabulous clothes in full view of the Eiffel Tower while they consider his offer. Naturally, Evangeline (Louise Lombard) falls in love with Paris: despite her youth and beauty, Evie is always on the cutting-edge of aesthetic appreciation – which you can tell because she often describes things as “beautiful” or “fascinating”. Older sister Beatrice (Stella Gonet) is also tempted by Paris, but frets about the future of the House of Eliott (as is her wont). To decide the matter, Bea’s boyfriend Jack Maddox (Aden Gillett) arrives and proposes to her. Jack and Bea marry and return to England, leaving Evie to chew a pencil and sketch elegant, long-waisted frocks at a different desk – and of course to learn about love and fashion, and to see more beautiful, fascinating things – all the while wearing more absolutely fabulous clothes. But Evie doesn’t stay in Paris for long. In this series, which takes the sisters through 1926 and the General Strike, the main developments are that their dear godfather and financial adviser Sir Desmond Gillespie commits suicide (or does he? ), which leaves the House of Eliott at the mercy of banker Ralph Saroyan (boo! ), who seems to be a bit of a financial twister (boo! boo!). Evie has an affair with an eager, jug-eared racing-driver from a jolly nice family – but, remembering the fate of her pilot boyfriend from the first series, she tearfully dumps him. She then takes up with an oddly uncharismatic government minister married to a saintly Lady in Waiting. Meanwhile, Bea and Jack argue repeatedly about the relative importance to Beatrice of a) Jack and b) the House of Eliott, and make appointments to talk about it. Longsuffering Jack becomes ever more attractive to the susceptible unmarried women in the audience; we would all marry him like a shot. Meanwhile, at the House of Eliott, a well-spoken “vendeuse” joins the business; in the workroom, feisty Madge and loyal Tilly defy the stickler-ish Florence once too often, and she momentously resigns, leaves the building, and is fatally struck down by the passing taxi. So it’s basically wonderful hokum, and I can’t wait for the publication of Series Three on DVD, which will pick up the story – where it leaves off here – with the Eliott sisters heading for New York to tour the US of A with a range designed for Sears Roebuck. Is there no limit to the girls’ success? Yet, what a price they pay in their private lives, forever putting the House of Eliott above their own happiness. No one would get away with this sort of clunky writing, nowadays, of course. It’s amazing they got away with it even in the Nineties, when Victoria Wood had already done Acorn Antiques (“What sort of antique are you looking for? I’m afraid we’re fresh out of antiques today!”) And so the appeal is limited, I know that. But it’s a very innocent appeal, and that’s why I love it. Basically, what The House of Eliott demands of the audience is that you simply admire and applaud these characters – for their fortitude, for their anguish and their determination, but principally, for their beauty and their unfailingly good taste in clothes. These days, few TV characters are offered in such a pure, old-fashioned spirit – especially not female ones. We’re all much too sophisticated. But I honestly think it does a person good to sit back occasionally and sigh, “Oh Evie, you are wonderful!” And if you find yourself guessing the line before she speaks it – “The colour! The texture! This is so beautiful and fascinating!” – well, what a good game to play, anyway.